About - Skiwi Ski Club - A club for all seasons! The Skiwi Ski Club is a not-for-profit, Michigan-based organization that has been around since 1959. We have over 130 fun-loving, active members (and growing). We hope you'll be next to join us. We are a year-round club and our interests are wide. We sponsor many local events from billiards to bowling and enjoy many sports such as hiking, biking, kayaking & more. You're sure to find others in the club who share your interests. We sponsor a diverse set of trips as well. Everything from canoeing and camping to rafting and horseback riding -- and like our name says -- SKIING!!! We can guarantee there will never be a dull weekend - Winter, Spring, Summer or Fall! If there's something you're into that isn't listed, let us know, as we're always looking for new events to run and new destinations to explore. Really, the club is a terrific way to meet a lot of great people who have a passion for doing fun things. Why not come down to one of our General Meetings and see for yourself. Don't worry about feeling like an outsider -- Skiwi's are the friendliest bunch you'll ever meet! 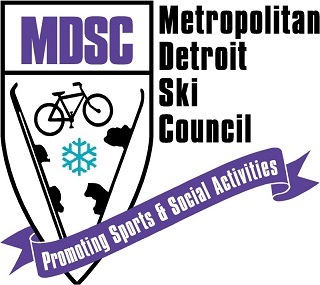 The Metropolitan Detroit Ski & Snowboard Council (MDSC) has existed since 1955 and is the umbrella organization for twenty six ski clubs located from Saginaw to Toledo Ohio, and from Grand Rapids to Windsor and Sarnia, Canada. Member clubs are both large and small, are for singles, couples and children, and are for the very young at heart.